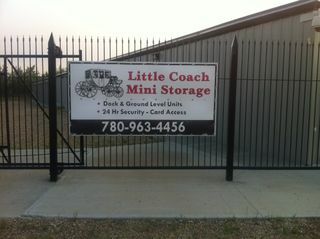 Little Coach Mini Storage, a Division of C. Schultz Enterprises is located in Stony Plain’s North Business Park, Little Coach Mini Storage offers worry-free storage at great rates. We are the best choice for quality and budget minded customers. We invite you to compare our rates and benefits with any other storage facilities. Little Coach Mini Storage provides a modern, clean and safe storage option for a variety of needs. We offer an affordable solution to all your storage needs at competitive rates for long or short-term rentals. We strive to make your rental experience simple and hassle-free. Upon entering our fenced and gated facility, our design allows you to drive right up to your unit for easy loading and unloading. There are no stairs to climb and our loading dock provides easy access to inside units. Our driveways are well-lit for your safety and convenience. Our facility has state-of-the-art video surveillance for added safety and security. We pride ourselves on bringing superior quality and value to every facet of the self-storage business. Get the most for your money when you store your valuables at Little Coach Mini Storage. Join other satisfied customers who already appreciate the value, security and convenience of access 7 days a week. Let us know how we can help you. Contact us today.